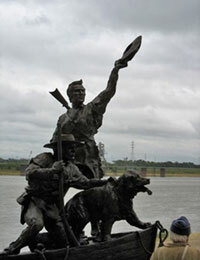 "The Captains' Return" a twice life sized statue of Lewis and Clark to honor the 200th anniversary of their return was dedicated on on Sept, 23rd, 2006. 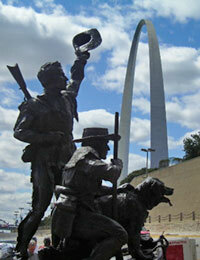 It stands in the shadow of the Arch on St. Louis' Riverfront. LewisandClarkTrail.com is your online connection for hotel reservations.